For the second year in a row these cuddly critters have seen out the colder months in the comfort of one of Council’s doggie doo bag dispensers in the northern part of the Shire. “Locals might be surprised to know that the Shire is home to a healthy population of Feathertail Gliders, spotting them in the wild though is difficult,” Andrew Morrison, Natural Assets Officer said. “They only tend to come out at night and are very agile and fast in the air, they dart about like a paper plane,” he said. According to the Australian Museum, the Feathertail Glider is the smallest gliding mammal in the world with an average weight of only 12 grams. Its feather-like tail is fringed with long stiff hairs that act like a rudder during flight. A gliding membrane extends from the animal’s elbows to its knees, allowing it to glide for more than 20 metres between trees. Rangers Tim Bosnjak and Mick Franic have taken a special interest in the welfare of this family of four gliders, who they believe benefit from the insulation provided by the roll of black plastic bags. “I came across them just going about my regular rounds, checking whether more bags were needed in the dispenser,” Mr Bosnjak said. 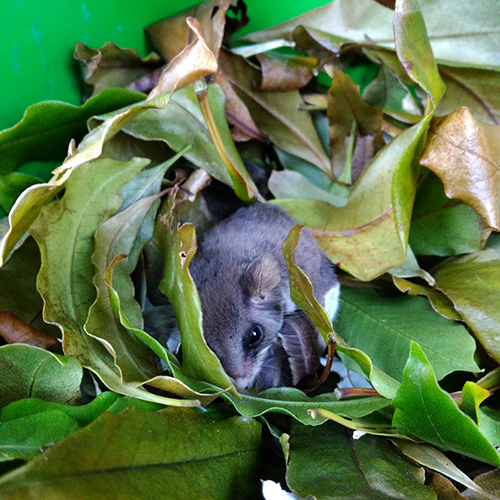 “I put my hand in and felt a bunch of leaves, on closer inspection I found that the Gliders had made a nest. “One of the Gliders ran up my arm, while the others took off,” he said. The Gliders soon returned to the bright green metal dispenser and have maintained the nest over winter, with Council Rangers mindful of their presence. “Mick found a fallen hollow tree branch while collecting firewood recently that Andrew is using to make a nesting box,” Mr Bosnjak said. The Feathertail Gliders will be relocated into the nesting box in the next couple of weeks. “Our plan is to keep them within their current territory and move them into bushland within a radius of 50 metres of their current home in the dispenser,” Andrew Morrison said. “Cats are a real problem for gliders in the wild, as they are for many small Australian animals. “Cat owners can play their part by keeping their pet inside or in an enclosure, or fitting a number of bells to their cat’s collar to make it hard for them to prey on small animals and birds,” Mr Morrison said. Council is grateful to those community members who continue to keep watch over these precious creatures while they squat in such a public asset. Photograph: A Feathertail Glider at home in one of Council’s doggie doo dispenser.